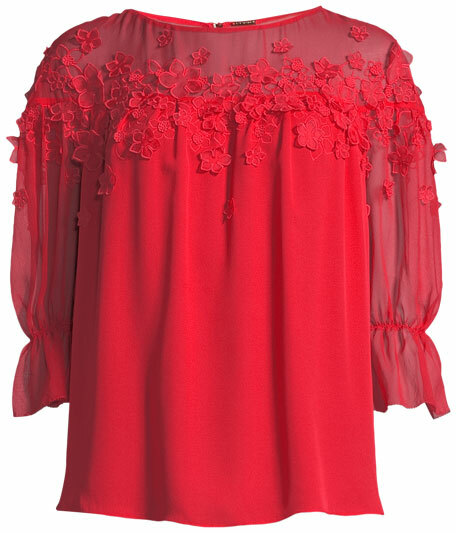 Elie Tahari "Neila" sheer blouse. For in-store inquiries, use sku #2461954. 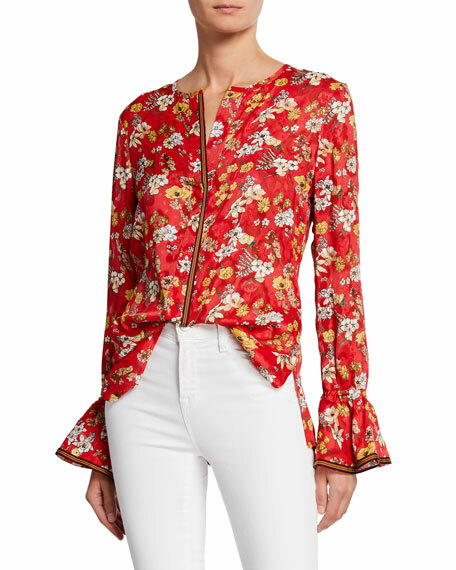 ALICE + OLIVIA JEANS "Randa" floral-print blouse with contrast collar and cuffs. Spread collar; V-neckline; button front. Long sleeves; trumpet cuffs. Semi-fitted silhouette. Even hem. Viscose shell. Silk combo. Imported. 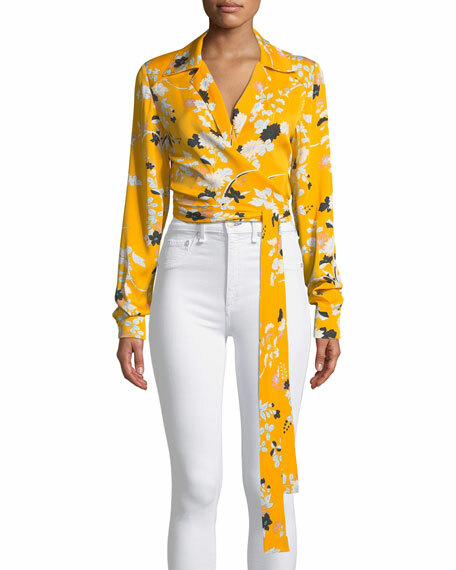 Derek Lam 10 Crosby floral-print blouse with rainbow striped trim. Crew neckline; keyhole back. Long sleeves; button cuffs. Relaxed, boxy fit. Slipover style. Silk/viscose. Imported. 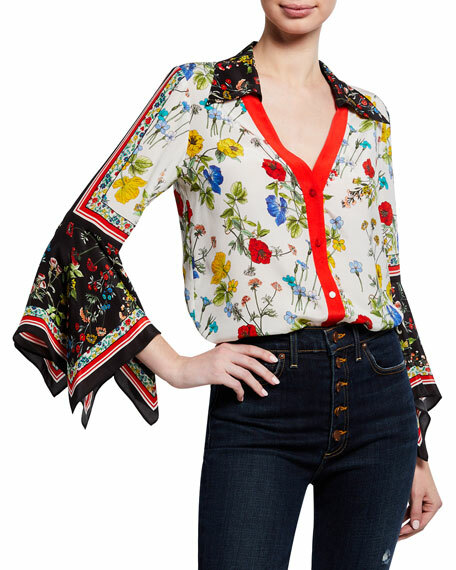 Diane von Furstenberg wrap blouse in floral pattern. Cropped at natural waist, approx. 18"L. V neckline with notched collar. Long sleeves; double-button cuffs. Wrap waist with long ties. Yoked back with pleats. Silk. Imported. 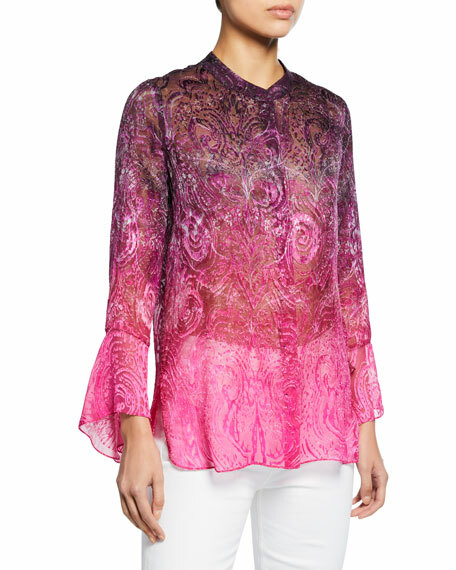 Elie Tahari "Chava" floral-print blouse. Band collar; hidden button front. Long sleeves; flared cuffs. Relaxed silhouette. Vented sides. Uneven hem. Rayon/silk. Imported.